Is LoRa on my RS broken? Hope I am doing something wrong. Got the LoRa receiver for M+ and trying to get that to work together. 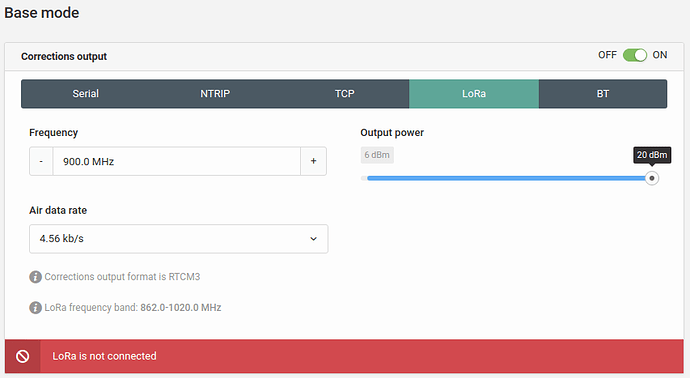 On the RS HTML interface I keep getting this red bar saying “LoRa is not connected”. The Apply button is disabled keeping me from saving any settings. There are couple of things you can try. 1.Make sure LoRa is not enabled under any other settings. 2.I assume the antenna is plugged into M+? 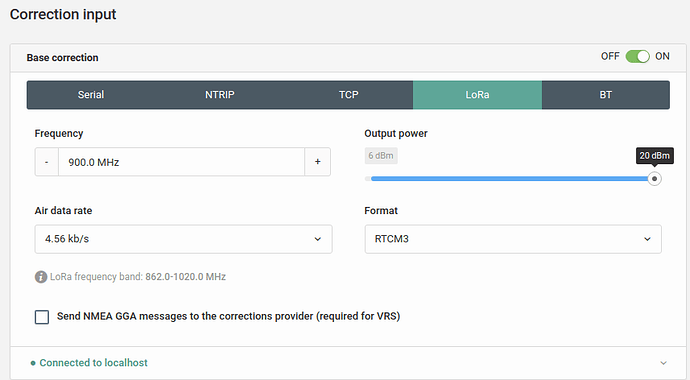 Am getting this message on the RS side, where LoRa is built-in. The antennas are connected to both RS and M+ LoRa unit. On the RS, LoRA is enabled only in the ‘Base Mode’. On M+ it is setup for the ‘Correction Input’. Are your LoRa settings identical in each the RS and M+? If you get this error on RS, the one you use as base. The LoRa output is set under base mode. That is what you have done, right? Settings are identical on both. Go into the settings (gear icon), and click “Reset settings to default”. How is it going? Did the reflashing help? No, it did not help. After reflashing upgraded to v2.16.2 too. Keeping getting this red bar “LoRa is not connected” on my Reach-RS action as base. But the rover is getting corrections over the LoRa link ok, so the radio seems to be working. At least the radio is working for you! But it is very strange that you are still getting the error message. No, it did not help. After reflashing upgraded to v2.16.2 too. 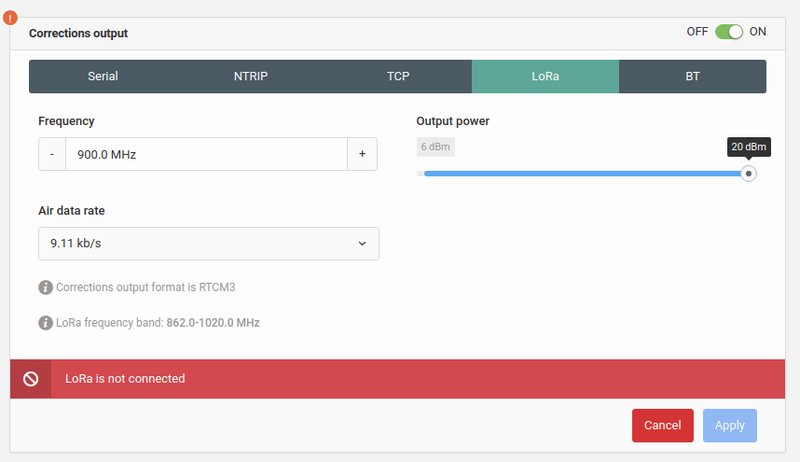 Keeping getting this red bar “LoRa is not connected” on my Reach-RS action as base. But the rover is getting corrections over the LoRa link ok, so the radio seems to be working. I’ve just replied to you in the email.